Intro: Let’s go get some rocks out of the ground people. This skill is on the slower side in the high levels. I think it’s a fun skill though to gather different types of ores. Items Needed: A pick axe, you really should get a rune one once you’ve reached 41. Quests: I STRONGLY recommend you do Doric’s Quest before even thinking about mining. It gets you 15 mining right away. You should also do Digsite Quest if you have the other skill requirements for it. That will get you to 33 and save you a ton of time. Little known fact: Rocks spawn faster in more crowded worlds, so whenever power mining, choose a world that has 1900-2k players. Probably best to mine copper ore and tin ores to keep it simple. Ess is far too slow to start out with, try to avoid mining ess to train your mining skill. XP Gain: 5-7k xp per hour. Iron is the absolute fastest way to 70. Don’t do granite in the 50s and 60s because it will not be anywhere near the xp you desire. 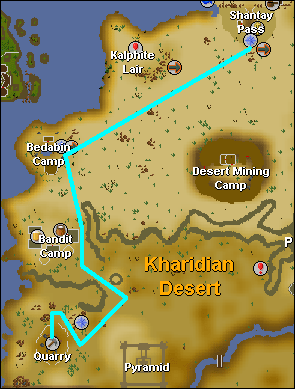 Go to the 3 rocks in Al-Kharid that make the triangle shape. This is the best spot. Either drop the ore you get from those rocks when you get a full inventory or trade them to a player. XP Gain: 45k-58k per hour without banking. I don’t like granite very much. It’s not an actual ore and there are different sizes. If you do it right though you can get up to 70k xp per hour. The granite rocks are located in the desert south of the Bandit Camp. Bring your rune pick and waterskins if you’re going to do this. Tips: I think mining iron is my favorite way to power level to 99 mining. It’s hard to explain but I just prefer it that way because it’s simpler. Also, try not to power level by doing coal or mithril rocks. It’s very slow and you won’t break 20k xp an hour even with the fastest coal miners in the mining guild. I do enjoy collecting the different ores and smithing them into bars though. That’s my mining guide folks, good luck on grinding to 99!!! Mining is a noble act that should be done for profit or smithing, never for a mere number! B J is going for the GW rank. Is this like the 4th Guide you've made in around 30mins? No I wrote up all these on a word doc while I was ban. Today, the mining is more easier to level up to 99 with the Motherlode mine. Making GP and getting a lot of XP. @Diggydug is right, you should not powermine granite to get 99, but doing a slower method and then getting GP. Sorry if I ''bump'' a old post but there is only 3 pages of guides so, I don't think this is gonna be a huge ''error''. Read my playthrough of OSRS right here!